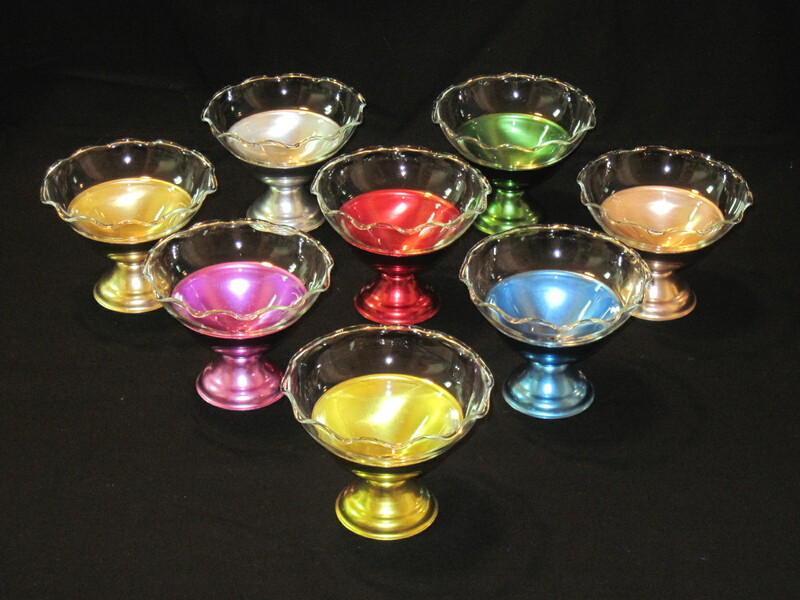 Set of 8 anodized aluminum sherbets with glass liners manufactured by Maid of Scandinavia, a subsidiary of a company called Nordic Ware, in the 1960’s. These are in beautiful condition, with only slight signs of usage. The glass liners lift out of the anodized base for easy cleaning. I found the bases sitting in the bottom of a box on a shelf at a store I frequent and knew they were missing something. I hunted around until I finally found the liners, stacked up and priced separately on another shelf. They obviously had not made the connection between the two but luckily, I did. I didn’t know who manufactured them until I did some research and found a set for sale on ebay in the original box which said only ‘Maid of Scandinavia’. Nordic Ware was founded by brothers Dave and Mark Dalquist and friend Donald Nygren in 1946. They were located in St. Louis Park. In 1949 the company bought out Northland Aluminum Products and the term Nordic Ware from Leonard Nordquist. Maid of Scandinavia began as a division of Northland Aluminum Products. In 1962 the company bought Northland Color Anodizing Co. (later Northland Metal Finishes) and purchased additional property from the Renner Well Co. Maid of Scandinavia and Nordic Ware became separate entities in 1963. Nordic Ware was focoused on manufacturing, while Maid of Scandinavia was strictly a mail order operation. I will be bringing these to the Ottawa Antique Show at Carleton University March 21st and 22nd 2015 to sell. For other ‘Fab Finds’ please visit my booth at the Almonte Antique Market, 26 Mill Street, Almonte ON, open 7 days a week, all year long.